In my introduction to the origin of horses I suggested that a horse is a horse of course, unless of course it isn’t a horse. But that begs the question, how do we know what the boundaries are of what constitutes a horse? Although I suggested that young-earth creationists (YECs) have diverse views of what constitutes a horse “kind” I did not intend to suggest that defining any taxonomic category whether species, genus or family is easy. In fact biologists and philosophers have debated the definition and meaning of species for the past century. In a general biology class in high school or college you probably learned that species are “groups of actually or potentially interbreeding natural populations, which are reproductively isolated from other such groups.” This is called the biological species concept (the BSC) and was proposed in its modern form by Dr. Ernst Mayr more than 50 years ago. This definition is not without its detractors in part because it only best applies to higher animals and doesn’t work so well for most other life-forms on earth. I teach an upper-level biological systematics course in which my students and I spend upwards of three-weeks discussing more than a dozen definitions of species and their philosophical roots. Students in that class hopefully leave with an appreciation for the fact that the exact definition of a species—if one is even possible—for all organisms is far from clear. Part of the problem is that identifying where one species starts and another ends can be very difficult and this difficulty extends to all taxonomic categories. Regarding horses, or equines more broadly in this case, the biological species concept (BSC) can be practically applied to define modern species of equines. Horses and donkeys can interbreed to produce mules but mules are sterile providing evidence that donkeys and horses are “reproductively isolated” from one another. Horses and zebras can interbreed and produce offspring despite having different chromosome numbers. However there is typically an added caveat of the BSC that is usually not stated in the simple definition and that is that interbreeding “occurs in natural conditions.” Yes, a horse and zebra can interbreed, but in nature even if they are in close proximity to one another interbreeding is an exceedingly rare circumstance and therefore the horse and zebra genetic pools remain genetically distinct over time maintaining them as separate species. Another example would be coyotes and wolves, they can interbreed and there have been cases of natural hybrids, however, these two “species” have lived in the same geographical areas for thousands of years and they generally won’t associate with each other in nature due to multiple behavioral differences. As a result they are effectively isolated from one another and thus maintain persistent genetic differences. So a horse is a horse because it recognizes itself as a horse and won’t, except under very unusual and unnatural conditions, interbreed with other animals that are not of similar morphological and genetic stock. Most of the 20 or more species concepts that have been developed to define the limits of species would recognize Equus ferus (wild horse + domesticated horses) as a species. But clearly, these horses are more similar to zebras, quaggas and donkeys than they are to kangaroos and bears. Those similarities suggest that though zebras, donkeys and horses are each distinct species today they likely share a common ancestor in the past. Even many YECs now appear to agree these species are all equines and share a common ancestor. These equines illustrate why the biological species have been so difficult to define. 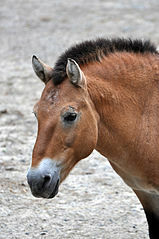 If there multiple species of equines alive today but they were all derived from a single common ancestor in the past, during the time that this single ancestor was “evolving” into seven or eight recognized living species there would have been points along the way in which the distinction between one and then two and then three species would have been difficult to pin down exactly. This is because they would go through periods where they may have become isolated but hadn’t yet developed any significant genetic or morphological differences. obtained the types of mutation that will either prevent fertile offspring or will alter them behaviorally (think of coyotes and wolves) so that the opportunities for future genetic exchange are reduced even further. Each newly gained bit of difference becomes a step toward the formation or “creation” of a new species. If we look back in time, at some point zebras were probably just an interesting variant within a larger population of animals most of which did not become zebras. They are like the Przewalski’s horse but at a time slice in the past we may have called all the species of zebras just one species with subvarieties. Going back further in time there may have been a time when there was only one clear species will only scattered variation that had not yet coalesced into clumps of genetically and morphologically distinct subspecies. So even if we define a species today, looking back through time that species will not always be as distinct as it is today. How different are equine species today? 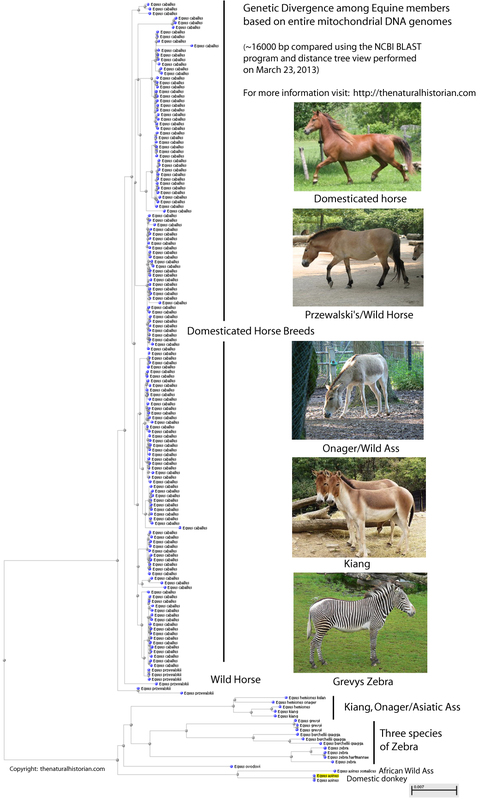 I can illustrate how genetically distinct horses are from other “horses” in the figure below. I generated this genetic similarity tree by comparing complete mitochondrial genomes (just over 16,000 total base pairs for each sample) between hundreds of breeds of horses and other species of living equines. 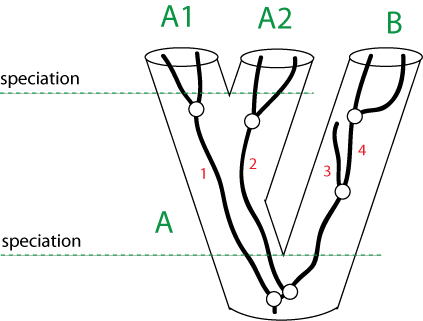 The figure below is a comparison of total genetic similarity of this genome with the branches/lines representing the total genetic differences between a particular sample and all other samples. It is hard to read the names but I have labeled the general groups. What you see is that all of the domestic horse breeds are remarkably similar genetically and thus very closely related to one another. The other “species” of horses are genetically distinct from horses and each species is nearly as different from one another as domestic horses are from those other species. This is similar to what one would observe with domestic dog breeds vs. wolves and coyotes and other canines. You can see that “wild horses” which are Przewalski’s horses are not much different from domesticated horses but as I said before, they are truly wild and so behaviorally differentiated from other horses. There are three accepted species of zebra each of which is genetically distinct from one another. While domestic horses have what appears to be considerable visible variability that variability is only skin deep. The zebras are far more genetically distinct from one another than any of the domesticated horses even though visually you may think they look very similar. Yes, looks can be deceiving. In the next part of this series on the horse we will look at what happens when we extend the idea of equine ancestry to the fossil record of horses. I have mentioned that YECs don’t seem to have a problem of all living species of horses having a common ancestor likening them all to be in the same created kind. But when the fossil record enters the story things start to get a little more confusing for YECs. How far can we push species concepts (or in the case of creationists the kind/barmin concepts) to accommodate greater and greater divergence of characters as being associated with a common ancestor? As we will see, YECs disagree about how far these boundaries can be pushed resulting in a diversity of opinions about the rate and mechanisms of evolution that are needed to explain present day species. So what is the number of miRNAs needed to make a kind distinct and how would you set that number without knowing what a kind is before you begin? What if Equus ferus has 200 unique miRNAs compared to Zebras but 520 from Donkey’s and 1000 from Eohippus assuming we could get that data. And how many unique miRNAs are found in individuals within a species vs a kind? The question then becomes how many total miRNAs were in the original created kind that could have gotten sorted into species within that kind but also how many novel miRNAs might have arisen since creation. Neither number is really knowable. And what happens if the number of miRNAs greatly differs between kinds? If so one would have to have a different scale for the number of miRNAs for each kind. I get the idea but it hardly seems like it is going to be easy. Its a bit like thinking we can use barcodes to do classification. there is a biological information law, which holds “use it or lose it”. Baranomes were frontloaded with redundant information. Depending on the niche, parts of the frontloaded information got stabilized, while unused information is recombined out of through the action of repetitive elements, such as LINEs and ERVs. Read my book and you know how genomes work to create variation, adaptations and how speciation occurs, It hardly takes time and this is the way that, for instance, the 500 species of cyclids of Lake Vicoria arose within a few thousands years. There is no need for novel information, THus, creation science has a very strong and realistic speciation model. Regarding your question above….if these organisms were all derived from the same baranome, it contained an additional 200 + 520 + 1000 = 1720 miRNAs. So, if you go back in time genomes are becoming more complex, not simpler. This is exacltly what we observe in Nature. There is deletion bias. Ergo: genomes fall apart and this is one of the mechanisms to bring forth novel species. Redundancy proves frontloading. Read my book for the evidence. Created as meaning hybridized, yes? Peer, how are indicator genes helpful when it comes to fossil species? As Joel pointed out, that’s where YECs have their biggest problems. The overall patterns we see in the fossil record (whether for horses or many other groups) makes no sense in the YEC paradigm, but is entirely expected and compatible with evolution. For example, only the latter explains why there are no pre-Cenozoic fossil horses (even tho they were supposedly living at the same time as horse-sized dinosaurs), and why in general, horse-like animals look less and less like modern ones the stratigraphically lower you go, None of the common YEC explanations for fossil succession (eco zonation, differential escape ability, or hydro sorting) begin to explain these patterns, and often only make the problem worse. For example, any hydro sorting would tend to preserve horses and horse-sized dinosaurs together, or at least at the same geologic horizons, yet we never find this. Why not? Likewise, why no ichthyosaurs with dolphins and whales? Why no rhinos and elephants at the same horizons as dinosaurs with similar habitats and sizes? The problem is even more dramatic and obvious when it comes to invertebrates and microfossils. See Joel’s posts on diatoms and forams for example, to appreciate how severe a problem this is for your view. there are indicator genes present in the genetic material isolated from Neandethalers and Denisovans, which shows they all were derived from the human baranome. There was an article in the most recent Journal of Creation on this topic. The data are there, we only have to reinterpret them from our own paradigm. Does your hypothesis have any predictive power? Pseudo-science can “explain” anything with enough magic and hand-waving, but actual science makes useful predictions. I fully agree, and this is why I moved away from evolutionary “science” and became a creation scientist. In the final chapter of my book, I summarized my theory and how it can be falsified. So they’re not unique at all. All of this begs a simple question. Why is it so hard for YECs to distinguish “basic kinds”? If all species share common ancestors, with countless intermediates, it’s understandable that identifying species and higher taxonomic categories will often be difficult. In contrast, if “basic kinds” were created by fiat, and shared no common ancestors, shouldn’t their differences be obvious, both with modern forms and in the fossil record? The differences between created kinds are still very clear and have been observed as novel classes of genetic information. Flowering plants, for instance, are a distinct created kind and over 1200 unique novel gene classes have been identified in these plants. HUmans and chimps also differ by over 1500 protein coding genes and 2555 miRNA genes. So, there is a quantitative information gap which cannot be bridged by a random mutational mechanism. We know this, it is true and it obliterates evolutionary scenarios. You are claiming that all flowering plants are one created kind, Peer, then? Seriously? Daisies and orchids and apple trees and rhododendron and gladioli and all the rest? Whereas, birds as similar as ravens and doves, being differentiated by name, and identical, presumably, to the modern birds of those names, as being on the Ark, must according to your interpretation of Genesis be different kinds? It never ceases to amaze me, often as I encounter it, to see the intellectual contortions that young earth creationists such as you will go through rather than admit that their claims about the natural world have no connection whatsoever with anything that can be properly called science, but only with their desperate attempt to take the wonderful stories in the first party Genesis as being literally historically true. maybe I should have said “created information”…I think that the flowering plants can be further split into created kinds, if we look at it in more detail. If you want to know how God created, I recommend to read my book. I wrote it in lazmen’s language, so there is no hurdle for anyone to get properly informed. Thank you, but if I want to read a rather beautiful set of myths designed to set forth the ideas of some ancient Hebrews about God’s creative powers and human relationships to Him and the rest of nature, in splendid early seventeenth century language, the KJV bible is readily available, whereas if I want to read the most up to date scientific models of the evolutionary history of life on earth, based on our ever increasing genetic and fossil evidence, written in layman’s language, there are many excellent resources on the internet, and on tv, as well as books by experts in their fields.I particularly enjoyed the recent Royal Institution Christmas lectures, for instance, beautifully designed to be appealing to and comprehensible by children, and therefore not telling me much that I hadn’t learned already, but still watched with interest and appreciation by the group of friends, mostly professional scientists, with whom I spent New Year. Nonetheless, Peer, I did register, and was pleased to find you not so lost to rationality as had seemed from your earlier post, that you had corrected that claim that flowering plants were all one kind. Which leads us back to the point made by Glen, which I don’t think you have yet responded to. Why is it so hard for young earth creationists who are attempting to provide a scientific alternative to the mainstream scientific model for the origins of the diversity of life as we know it, and the history of life on earth, to set out one clear unequivocal list, agreed by all of you, of all the original kinds, what each of them looked like, and even, in the light of modern genetic sequencing, make a stab at starting to reconstruct the genomes that these original kind ancestors must have had, that enabled them to, you claim, to give rise to all the present days forms and fossil forms that you claim derived from them? We know, and it has already been discussed on this webpage, why evolutionary biologists can’t draw hard and fast lines between species, particularly extinct ones. It arises from them having all, at some time in the past, of greater or lesser antiquity, derived from common ancestors. They can’t breed together now, but for all of them there was a point way back in time when their ancestors could. But this should not be a problem for the supporters of kinds. The farther back we go in time, the more sharply should these kinds be differentiated, the nearer to their first separately created ur-types, while for the evolution- supporter the ancestors draw ever closer together the further back in time. The Natural Historian has promised us, in Part III, a more detailed look at the common ancestor of all equines. perhaps you would like to do your own version and tell us specifically what YOU think the common ancestor of all equines, of equine-kind, was like, in size, toe number, habits, and so on. Do these horsey types know about genes in segregating themselves? Just kidding but they know something. This YEC says species has nothing to do with reproduction. All that is needed is a segregated population with a different bodyplan from the parent one. therefore whatever the mechanism is for change IT HAS HAPPENED. A new species has been created. Whether they can still breed with the parent/subling groups is irrelevant to the mechanism. Reproduction only is useful to maintain the segregation but thats still beside the biological process point. its the bodyplan change that should rule definitions. I think diversity was fantastic soon in the old days. we only today can see a HORSE or Zebra because of poverty in survivors. so the easy adaptability of creatures to change bodyplans is hidden. tHe amazon or those ciclid fishes in africa being rare cases of the old days. I don’t think there was a horse on the ark but some different type of creature. The horse is adapted to a running lifestyle that would not likely of existed before the flood. Some of the small “horse” fossils might be closer to the origial creature but it might include many creatures that look very different. Its just a KIND and then anything can go. Speciation occurs without selection. It is an intrinsic phenomenon of the baranomes and it is driven by repetitive genetic elements, which evolutionary “science” defined as junk DNA. Speciation is a rapid process, since it only required a resdistributing of frontloaded information. It is an emerging properties and results from position- and number effects of this information. There was probably only one horse-like organism present on the ark. The emergence of horse-like animals likely involved LINEs and ERVs, since they still play pivotal roles in adaptation and speciation processes (as explained in my book of 2008 and in the JoC of 2008 and 2009).